This NCLEX review will discuss asthma. 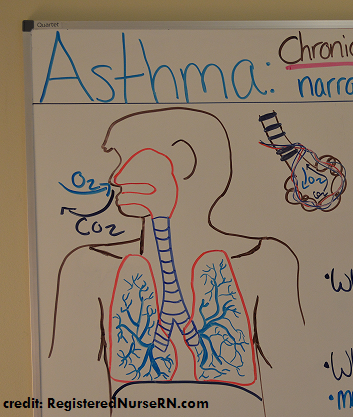 As a nursing student, you must be familiar with asthma along with how to care for a patient experiencing this disease. Don’t forget to take the asthma quiz. What is it? 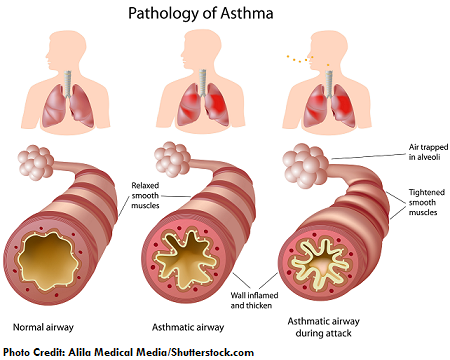 Asthma is a chronic lung disease (no cure) that causes narrowing and inflammation of the airways (bronchi and bronchioles) that leads to difficulty breathing. First, let’s talk about what should happen normally with breathing! Normally, when you breathe in air, it travels down through your upper airway to your lower airway, which is the trachea, bronchi, bronchioles, and alveoli (where gas exchange happens). The oxygen you breathe in crosses over into your blood stream and the carbon dioxide in your blood crosses over into the airway to be exhaled. What is happening in patients with asthma? In patients with asthma, the bronchi and bronchioles are chronically inflamed and can become so inflamed that it leads to an asthma attack. This will cause the patient to experience wheezing, chest tightness, shortness of breath, and coughing. An asthma attack occurs due to a trigger of some type (discussed later). What surrounds these structures? Surrounding the bronchi and bronchioles are smooth muscles that wrap around the airway. This muscle helps with dilating and constricting the airway. During an asthma attack, these smooth muscles constrict. This causes chest tightness and difficulty breathing. What is inside these structures? Inside these structures is a mucosa lining which contains special cells called goblet cells. Goblet cells produce mucous, which helps trap the irritants and bacteria we breathe in and prevent these substances from entering further into our respiratory system. During an asthma attack, the mucosa becomes very inflamed (this narrows the airway…decreasing air flow and air becomes trapped in the alveoli). The goblet cells (due to the inflammatory response) produce excessive amounts of mucous. Hence, leading to further decrease in air flow: coughing, wheezing (as air tries to flow through the narrow airway and around the mucous it makes a musical whistling sound). During this, air is becoming trapped in the alveoli . Therefore, gas exchange is not taking place and low amounts of oxygen are entering the blood (the patient will have decreased oxygen saturation) and carbon dioxide is staying in the blood (patient will have the buildup of CO2…..respiratory acidosis). The patient will feel like they can’t exhale all the way. Now asthma attacks vary in severity among patients. It is important for the patient to recognize the triggers and early signs and symptoms of a pending asthma attack (discussed below). These early signs and symptoms are different for every patient, but as the nurse you will need to teach the patient how to recognize them. They will usually have these signs and symptoms 1 to 2 days before an attack. In addition, the patient will need to follow an asthma action plan created by the MD and the patient. 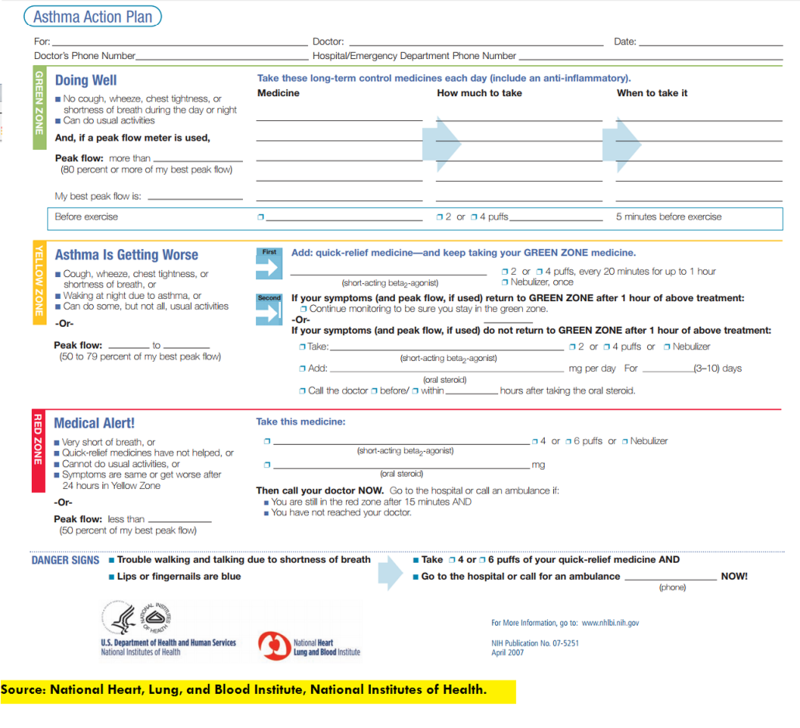 What is an asthma action plan? It is a plan created to help the patient control their asthma based on the patient’s current signs and symptoms, along with using a peak flow meter. The asthma action plan has three zones (green, yellow, and red) and based on the patient’s signs and symptoms, they will treat their asthma with the prescribed medications. See a sample action plan below. Can progress to: where rescue inhaler won’t work, can’t talk easily, chest retractions (stomach sucked in, chest sticking out along with collarbone with each breath…this means the patient is not getting enough air into the lungs), cyanosis of the lips and skin, sweaty…need medical intervention fast!! How does the patient use a peak flow meter? As represented in the picture above, the patient will exhale as hard as they can onto the device. The device will then measure how much air was exhaled out of the lungs. Many times a peak flow meter is used with an asthma action plan created with MD. As stated above, the device measures the airflow out of the lungs (large airways) not small (so the patient needs to know early warning signs too). It helps the patient know when they need to take a short-acting bronchodilators and when they should go to the hospital for treatment. When a patient starts using a peak flow meter, they need to FIRST figure out their personal best peak flow meter reading. This will be the highest number reached over a period of time. It will be the number used to compare against other reading numbers, which will allow the patient to know if their asthma is under good control. How is the personal best peak flow meter reading figured out? The patient will use the peak flow meter to figure out their best peak flow reading when their asthma is under good control, and measure it once in the morning and once at night for 3 weeks usually and record the numbers BEFORE TAKING MEDICATION. The highest number they obtain over this period of time will be their personal best reading. Then they will need to continue to use the peak flow meter at the same time every day, either in the morning or at night BEFORE TAKING MEDICATION, and compare it with the personal best reading. If the reading is 80% or less than their personal best, they need to follow the action plan created with their doctor. You will be providing them with education on how to follow their prescribed asthma action plan (quiz the patient to ensure they understand how to follow the plan). Help the patient identify triggers (educate them on the triggers), how to avoid (except exercise-induced) and those early warning signs. ***(if patient is using their inhaler more than 2 times a week, then the patients asthma plan needs to be readjusted because their asthma is not under good control). Ipratropium: a bronchodilator that also is short-acting and relaxes airway….used when a patient can’t tolerate short-acting beta agonist. AVOID consuming products with caffeine while taking this medication…WHY? Caffeine has the same properties as Theophylline, which can increase the toxic effects of the medication. *****Always administer the bronchodilator FIRST and then 5 minutes later the corticosteroid. If not responding to treatment, may need intubation and mechanical ventilation. Anti-inflammatories: decreases swelling and mucus production…used as long-term treatment to control asthma not an acute attack. May be given IV or PO for severe asthma attack. stops mast cells from secreting histamine. This decreases inflammation. While receive the patient may temporarily experience sneezing, burning in nose, itchy/watery eyes, bad taste in mouth.